We love love love a shining review from our Get Fruity fans, so when we received this lovely email and photo from two very happy looking fruit lovers we had to share it with everyone. “Good eveningI just wanted to thank you for the samples of your Get Fruity bars you sent for my son and I to try.We really enjoyed them! They are really soft and absolutely packed with flavour, my son really loved the strawberry one!I have attached a picture I asked my friend to take of my son and I eating our bars. I will be buying some more as my son has asked to have them in his lunch box. I have also recommended the bars to my friends and family so hopefully they’ll all go out and buy them too. 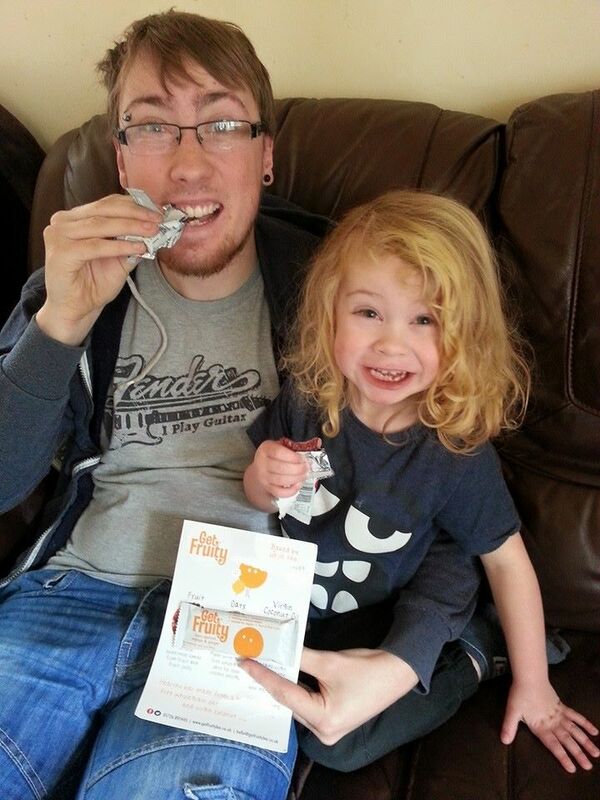 Thanks Connor we are so happy you and your son enjoyed them : ) we have lots of little Get Fruity fans but we are always trying to encourage kids to try our fruit and oat bars. They are not only packed full of goodness and 100 percent natural but they are also soft and sweet so kids find them easy to eat and super tasty!